Super excited to launch a new series! That’s right – September is the new ‘new year’! And it’s time to simplify our cleaning and organizing. Today, I’m going to show you how to stock and organize a cleaning caddy! Step One: Purge! Start with a clean slate. Gather all your cleaning products in one place. Pitch empties and the ones that don’t work and don’t smell nice. I also opted to go as ‘chemical’ free as I could. Step Two: Divide your house into zones. In our case – three storey house? Three zones. Easy peasy. If you have a bungalow, you might do living space/bedrooms, kitchen/dining and bathroom. You feel me? Step Three: Consider BASIC needs for your zones and MAKE A LIST. Also consider where in each zone you can STORE cleaning products. A kitchen cabinet, linen cupboard, bathroom vanity, broom closet – have a spot in each zone. 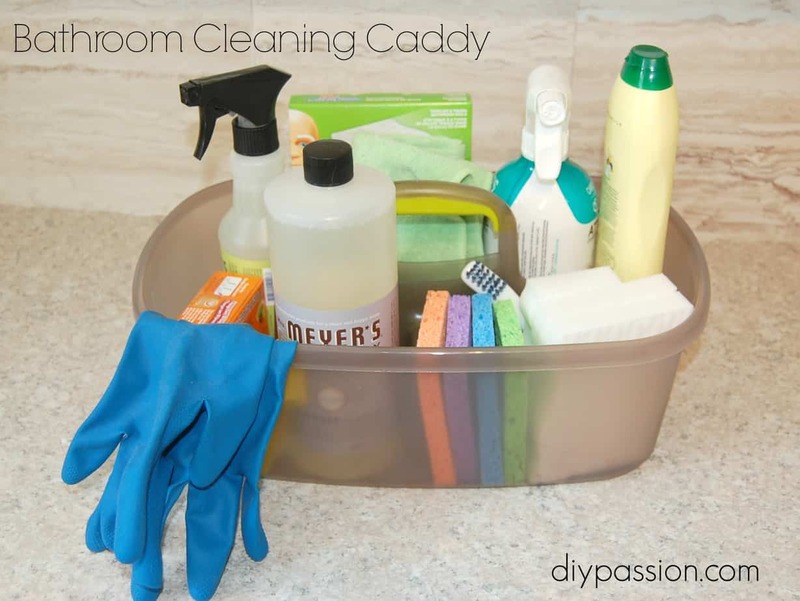 Here’s what you need to stock your cleaning caddy to the MAX! 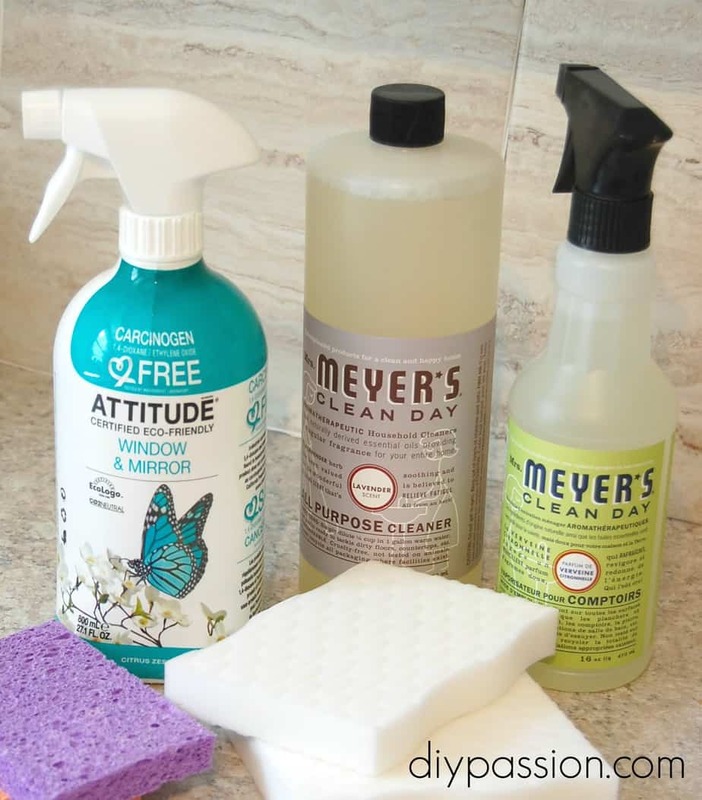 A good all-purpose cleaner – this will cover walls, counters, baseboards, floors and even toilets. YES TOILETS. Diluted it works on most surfaces. A couple caps Undiluted in the toilet bowl works just as well as that chemical stuff. Saves you dealing with yet another bottle, right? Baking soda & Cream Cleanser – Baking soda removes odours on carpets and can be used as a mild scouring agent when mixed with cleaner. Having said that, I just can’t give up on Vim. I love it for cleaning our sinks and tub with a Magic Eraser. Step Four: Consider zone SPECIFIC needs and add those to the list. The main floor needs ceramic stove top cleaner and a stove top scraper. It also needs dish soap and counter top disinfectant for quick cleans. The upstairs needs daily shower spray and a squeegee and heavy duty Magic Erasers. Now take your list to the store and buy as many cleaning caddies as you have zones. I bought two 4-gallon caddies at Target and I used a big bucket for the basement zone. Fill each caddy with all the stuff you need for each zone! This will mean duplicating some products. Leave your cleaning caddy in it’s appropriate zone and know that you have EVERYTHING you need to completely deep clean one area of your house in an hour or less. Go top down in each room and you’ll be clean in no time! Heck, even if you just do the vertical or horizontal surfaces in one room, you’ll feel like you’ve accomplished something. Voila! That’s how we roll. Next up in this series, I’m going to share my top secret tip for ACTUALLY getting rid of those pesky and disgusting fruit flies in the kitchen.